Deftones have built their legacy upon this constant creation of musical/vocal friction, and the kinetic energy that comes from combining grace and aggression has been masterfully harnessed on Koi No Yokan and expelled throughout. To say the members of Sacramento’s finest, Deftones, have experienced the more extreme ends of life’s unpredictable spectrum would be an understatement. From creative and commercial success to personal disasters, inter-band tension to reconciliations, damning addictions to rehabilitations, these guys have lived through noteworthy highs, as well as some bitter lows. In light of this, the fact that this band is still together and creating music 25 years on is an achievement in itself; even more so when you consider that their peers from the heyday of the ‘90s nu-metal scene have either imploded or descended into self-parody. But the real cause for celebration comes from Deftones’ ability to continue to create relevant music – an achievement that could not have been foreseen around the time of the disjointed Saturday Night Wrist, when guitarist Steph Carpenter and vocalist Chino Moreno were pulling in different directions creatively and band relations, as a whole, were in a precarious state. Unfortunately, it took a near-fatal car accident in 2008 that left bassist Che Cheng in a coma – from which he has yet to make a full recovery – to unite egos and mend lifelong friendships. In the wake of this tragedy, Moreno, Carpenter, Abe Cunningham (drums) and Frank Delgado (turntables/keyboards) turned to creating music as a means to cope with inability to grieve for the limbo-stricken Cheng, and this focus – plus the stability from bassist Sergio Vega, formerly of Quicksand fame, joining the fold – rekindled the fire and invention missing from Deftones since the ethereal majesty of 2000’s landmark, White Pony. 2010’s Diamond Eyes was the outcome of this artistic rejuvenation, and this record bristled with infectious energy and some of the most gratifying songs of Deftones’ career: “You’ve Seen the Butcher”, “Rocket Skates”, “Beauty School” and “Risk” being palpable highlights. Diamond Eyes was a particularly significant release for the band; not only did its creation process provide an escape from the ruthless realities each band member was facing, upon its release, this record was raised high and lauded as a huge return to form for Deftones. It also gave each member confidence in their collective songwriting chemistry, and this poise has been injected into the 11 songs that comprise the evocatively titled, Koi No Yokan, Deftones seventh studio album. Deftones’ approach to their latest album is notably different than Diamond Eyes, in that, the majority of songs are elaborately layered and contain interesting intros/outros that make Koi No Yokan play out as a continuous piece of music rather than a collection of songs that have no relationship with each other. 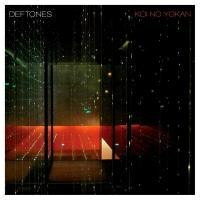 Koi No Yokan also sees Deftones employ the production skills of Nick Raskulinecz for the second time in a row, and their interactive relationship is beginning to resemble the band’s highly successful past partnership with Terry Date. And Raskulinecz has done enough to make this album sound expansive, especially during more elaborate compositions: “Tempest”, “Rosemary” and “Entombed”. These three tracks form the framework of Koi No Yokan and perfectly showcase Deftones’ reputation for moving between moments of heart-stopping ferocity and diaphanous introspection, as well as their supreme control over dynamics.“Tempest” utilizes the capture-and-release found in post-rock/metal instrumentation, with Moreno painting vivid pictures through his lyrics and conjuring some of the most captivating vocal melodies of his career. “Entombed” shines bright amongst the heavier tracks and sparkles with Delgado’s arctic synths. The song itself is reminiscent of White Pony’s more atypical influences (Lush, Slowdive, Massive Attack). The mid-section of “Rosemary” come as close to doom metal as Deftones have ever ventured: the song begins with sparse synths and delayed guitars, which are equalized by Vega’s revving bass lines and Carpenter’s signature marble-heavy riffs, and an outro that matches the guitar beauty that Billy Corgan attained on Siamese Dream. Elsewhere on Koi No Yokan’s more heavyweight additions – “Poltergeist”, “Gauze”, “Goon Squad”, and “Graphic Nature”, not to mention the quality of the lead single, “Feathers”, and the bouncing, mechanized riffs of opener “Swerve City” – Deftones pull the listener closer and choke with the same caress. Each of these songs drill home the punctuating power of the rhythm section, with Vega/Cunningham rattling teeth and emphasizing the violence and weight of Carpenter’s signature riffs with rhythms that are unafraid to swing. Vega gives the impression that he is much more comfortable with his role in the band this time round and his bass playing has begun to take on a personality of its own – much like his work with Quicksand. However, it is Moreno’s distinctive vocal performance that truly elevates the stature of each song: his sexually murderous delivery dripping over the liquid latex grooves of “Graphic Nature”, his calypso phrasing contrasting with the bloody “Gauze”, and his pitched shrieks and glorious croon echoing around the mountainous riffs of “Goon Squad”. Deftones have built their legacy upon this constant creation of musical/vocal friction, and the kinetic energy that comes from combining grace and aggression has been masterfully harnessed on Koi No Yokan and expelled throughout. At times during their existence, Deftones have been their own worst enemy, but the rich vein of form revived on Diamond Eyes continues with Koi No Yokan and does not show any signs of exhausting itself. When it comes to metal, positivity is not an energy that normally fuels artistic endeavours, with band’s preferring to rely on negativity to fuel their creative fires. But this fit and lean version of Deftones have turned negativity into vibrant positivity and channelled it into their cohesive and textured seventh full-length, Koi No Yokan – a record that will forever sit high upon Deftones’ burgeoning list of impressive achievements.